The Venmo iPhone app is exactly what it claims to be: “a fun and simple way to pay your friends” and also to get your friends to pay you back. The graphics are clean and simple and the app is overall very easy to navigate. 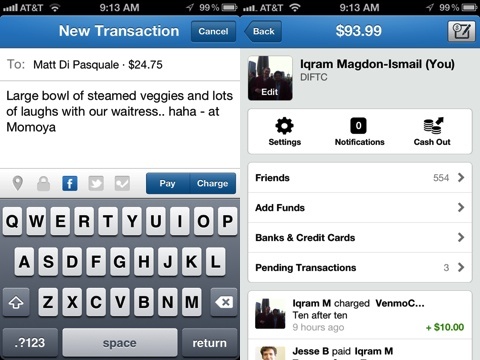 The main screen for the app looks like the Facebook news feed page, showing Venmo paybacks by users. You can change this to view only your transactions by tapping the two-headed icon (the icon next to it of the world shows all transactions). To start, you create an account for yourself by signing in with either your email or Facebook account. Once you have signed in, you will create a profile for yourself which will be the main page from where you make your transactions. If you want, you can take or upload a photo of yourself and add your bio to personalize your page. 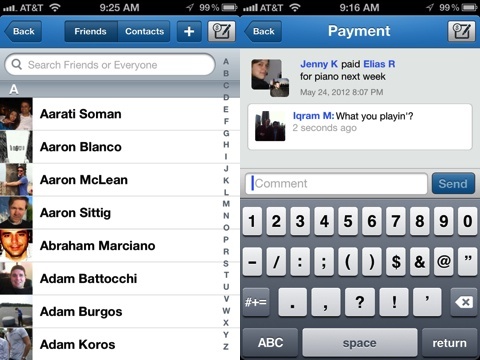 Venmo allows you to access your friends easily through your iPhone contact list or Facebook. Once you have your profile set, the first thing you want to do is either register whichever bank account, debit or credit card you want to use to make transactions. To verify your account, Venmo will place 2 small deposits in your registered account which takes 1-3 days to process. Once they show up, you’re good to go. Additionally, you have the option of transferring money from your bank account to a Venmo fund. This doesn’t seem like an option that would be very useful given that it takes 5 business days for these funds to transfer and there is a maximum amount of $2,000 (for those big spenders out there). Making a new transaction is just like writing an email. You access it by tapping icon in the top right corner of the screen. Type in the name, email or phone number of the friend you’re making the transaction with followed by the dollar amount. In the ‘body’ of the email you write what it’s for. Once you fill out this, the ‘Pay/Charge’ button in the middle of the screen will highlight so you can indicate whether you’re paying someone back or charging them for money they owe you. You can also link Venmo to your social media, make it a private message, or indicate your location in the buttons to the right. To finish the transaction, go to the ‘Cash Out’ button on your profile page to pay or accept your money. What’s the best part of this iPhone app? It’s free. Instead of having to pay transaction fees for different banks, you can use this easy and secure app to make sure your debts are settled. Venmo works with all major bank accounts in the US. However, be aware: paying by debit card, bank transfer, or Venmo account is always free; but if you use a credit card there is a 3% fee. AppSafari review of Venmo was written by Sally Pope on July 17th, 2012 and categorized under App Store, Finance, Free, Utilities. Page viewed 7339 times, 2 so far today. Need help on using these apps? Please read the Help Page. Venmo is an absolutely terrible company. They somehow got my telephone number and they have been sending me a text about once a week saying I have gotten a couple of dollars from Money Tree so that I will sign up. I do not want to sign up and I do not want the text messages. They do not provide any method I can find to get off of their SPAM text message lists. THIS IS A TERRIBLE business model and a TERRIBLE company. Posted on August 28th, 2015 at 6:41 pm by oliver w.